Barack Obama currently fares as well against a generic opponent in the upcoming presidential election as George W. Bush did in April 2003, a time when Bush’s job approval rating was much higher than Obama’s is today. He also tests considerably better than Bill Clinton did in March 1995. Nearly half (47%) of registered voters say they would like to see Barack Obama reelected, while 37% say they would prefer to see a Republican candidate win the 2012 election, according to the survey by the Pew Research Center for the People & the Press conducted March 8-14 among 1,525 adults. In April 2003, 48% of registered voters said they would like to see Bush reelected in 2004; 34% said they would prefer to see a Democrat win. At the time, the Iraq war was viewed as moving to a successful conclusion and Bush’s job approval rating among the public stood at 72%. In a survey released earlier this month, 51% of the public approved of the way Obama is handling his job as president. In part, Obama is benefitting from the fact that the GOP has yet to coalesce behind a candidate. About one-in-five (21%) Republican and Republican-leaning registered voters say they would like to see Mitt Romney win the nomination while about the same percentage (20%) chooses Mike Huckabee; 13% back Sarah Palin, 11% opt for Newt Gingrich and 8% back Ron Paul. At this early stage in the race, 15% of GOP voters have no preference. The race for the Republican nomination has gotten off to a much slower start than the presidential race four years ago. The Pew Research Center’s news interest surveys have found that the campaign is drawing far less coverage and public interest than the previous presidential campaign at this stage. During the 2008 campaign, there were nomination races in both parties. Through the first 10 weeks of 2007, coverage of the campaign accounted for about 7% of all news coverage on average, according to an analysis of coverage by Pew Research’s Project for Excellence in Journalism. Through the first 10 weeks of this year – a period that has seen a series of major international stories – coverage of the 2012 campaign has accounted for only about 1% of the newshole. The survey finds that Barack Obama’s personal favorability remains fairly strong: 58% of the public say they have a favorable opinion of him while 39% view him unfavorably. Michelle Obama’s favorable ratings continue to be higher than her husband’s. Currently, 69% say they have a favorable opinion of Michelle Obama, compared with 21% who have an unfavorable opinion of her. Views of John Boehner are little changed from December, the month before he officially became speaker of the House. About a quarter (26%) say they have a favorable opinion of the Ohio Republican, 27% say they have an unfavorable opinion. 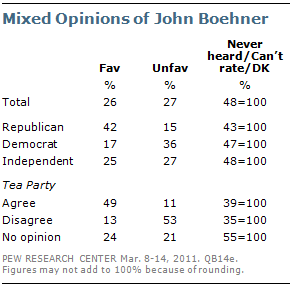 Nearly half (48%) have never heard of Boehner (32%) or cannot rate him (16%). Meanwhile, favorable ratings for Obama’s two predecessors in the White House have improved considerably since 2008. Currently, 42% say they have a favorable opinion of George W. Bush while 54% have an unfavorable view. Bush’s favorable ratings are at their highest point in four years and have increased from a low of 31% in April 2008. Bill Clinton’s favorable ratings have rebounded after declining during Hillary Clinton’s campaign for the Democratic nomination. Currently, 67% have a favorable opinion of Clinton, up 15 points since February 2008. Clinton’s current mark is in line with his ratings in 2005 and 2006. In his reelection race, Obama is running about as well as Bush did at this stage in 2003. Obama holds a 10-point lead even though opinions about the president and his party – and views of national conditions – are much less positive than they were for Bush and the GOP in April 2003, when the Iraq war was still widely seen as going well. For most of the past year, the percent expressing positive views of national conditions has remained below 30% (22% in the new survey). In April 2003, fully half of Americans (50%) said they were satisfied with the way things were going in the country. 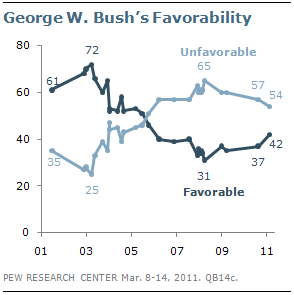 While Obama is viewed favorably today (58%), Bush’s favorable ratings in April 2003 were much higher (72%). More than six-in-ten (63%) viewed the GOP favorably in April 2003; today 48% have a favorable opinion of the Democratic Party. Yet Obama and his party hold several advantages. For one thing the Republican Party’s image is fairly negative. Just 42% have a favorable opinion of the GOP while 51% view the party unfavorably. The public currently has a mixed view of the Democratic Party (48% favorable vs. 45% unfavorable). Moreover, the Democratic Party currently holds a seven-point lead over the Republican Party in party affiliation (32% to 25%) in Pew Research surveys conducted so far this year. In early 2003, as many people affiliated with the GOP (31%) as with the Democratic Party (31%). Comparisons between Obama and Clinton at a similar point in his reelection bid are difficult, because of the prospect that Clinton would face a three-way race with a viable independent candidate, Ross Perot. 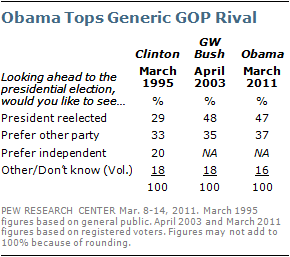 Still, while Obama holds a clear lead in the generic ballot, in March 1995 Clinton ran about even with unnamed Republican: 29% of all Americans said they would like to see Clinton reelected, 33% said they would prefer an unnamed Republican and 20% said they would prefer an independent candidate. In many ways, Clinton’s position at the start of the 1996 campaign was far weaker than Obama’s is today. The Republican Party’s favorable ratings were 17 points higher than the Democrats’ (67% to 50%). In addition, the GOP held an edge (34% to 29%) over the Democrats in party affiliation, based on surveys conducted in February and March 1995. As the 2012 campaign begins to take shape, Obama leads among many of the same groups that supported him strongly in the 2008 election – minorities, young people and low-income Americans. However, as in 2008, Obama trails among white voters: 36% say they would like to see Obama reelected while 47% say they would prefer to see a Republican candidate win. According to 2008 exit polls, Obama lost the white vote to John McCain by 43% to 55%. Among independent voters, 40% say they would like to see Obama reelected, while 34% would prefer to see a Republican win the White House. At this point, roughly a quarter of independents (26%) offer no opinion. In the 2008 election, Obama outpolled McCain among independents, 52% to 44%. With Republicans still deciding whether to jump into the race for the party’s 2012 presidential nomination, none of the most frequently mentioned potential candidates yet stands out as a front-runner. Romney and Huckabee generally garner the most support across the ideological spectrum of Republicans and Republican leaners. But Palin nearly matches Huckabee among those independents who say they lean Republican (18% for Huckabee, 16% for Palin), while 13% of GOP leaners say Paul is their top choice. Paul, best known for strong libertarian views, fares better among these GOP-leaning independents than he does among self-described Republicans (5%). Among those who say they agree with Tea Party movement, 24% say Romney would be their first choice, 19% say Huckabee, 15% say Gingrich, 13% say Paul and 12% say Palin. Looking at family income within Republican and GOP-leaning registered voters, Romney garners more support from households earning at least $75,000 a year (27%) than those earning less than that amount (18%). Palin attracts greater support from households earning less than $75,000 (17% vs. 7%). 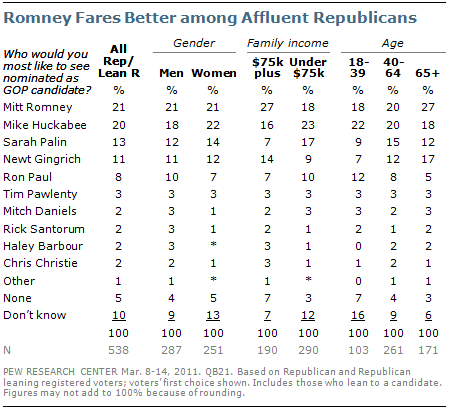 At this point, age does not seem to be much of a factor, though Gingrich gets more support from Republican voters 65 and older (17%) than among those under 40 (7%). Three-in-ten among those who attend church weekly (30%) say their first choice is Huckabee, much greater support than for any other potential candidate. Huckabee also leads among white evangelical Republicans: 29% say their first choice is Huckabee, compared with 16% who favor Palin and 15% for Romney. 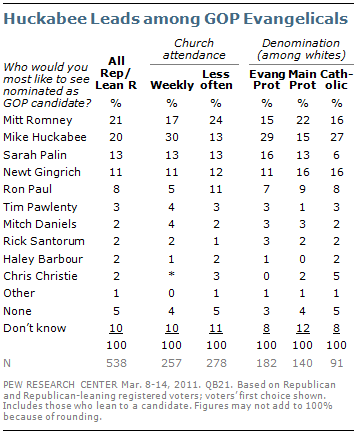 Huckabee holds a comparable lead among white Catholic Republicans and leaners. The preferences of Republican and GOP-leaning voters by religion, income and other factors are based on the voters’ first choice for the nomination. Including their second choice does not change the overall picture: Among Republican and Republican-leaning registered voters, 35% say Huckabee would be their first or second choice, 31% choose Romney, 27% choose Palin and 23% choose Gingrich. Paul is the first or second choice of 16%. At a time when the media and the public are tracking major breaking stories on the international and domestic fronts, the early steps in the 2012 campaign have yet to capture much attention. 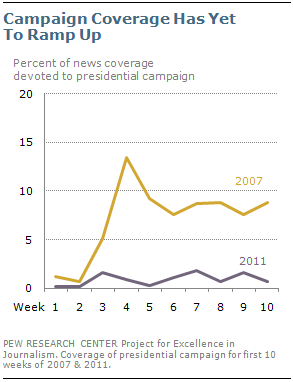 In early 2007, with nomination fights underway in both parties, coverage was significantly higher. Interest was higher as well – especially among Democrats – as Obama, an African American, and Hillary Clinton, a woman, proved to be strong contenders for the party’s nomination. While coverage of the presidential campaign accounted for 7% of newshole, on average, during the first 10 weeks of 2007, so far in 2011, campaign news has accounted for just 1% of coverage, according to the Pew Research Center’s Project for Excellence in Journalism. The public has expressed only modest interest in the 2012 campaign. In a recent News Interest Index survey, conducted March 10-13, 15% of the public said they were following news about the 2012 presidential candidates very closely. 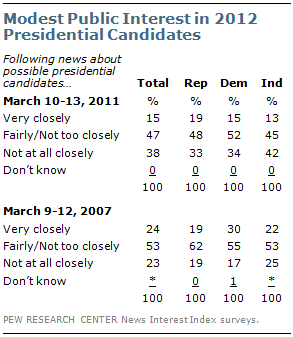 During a comparable week in March 2007, 24% said they were following the campaign very closely. 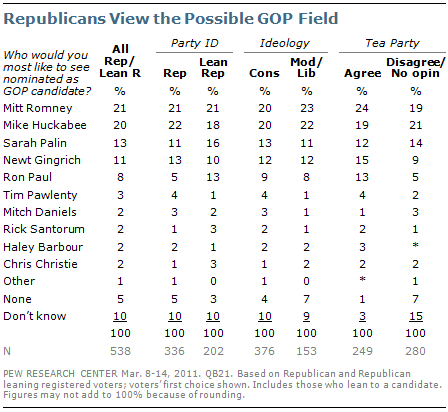 As many Republicans are now paying close attention to the campaign as in early 2007 (19% very closely). But substantially more Republicans say they are not following campaign news at all closely: Currently, 33% say they are following news about the 2012 candidates “not at all closely,” up from just 19% four years ago. Barack Obama’s overall favorability rating remains positive; 58% hold a favorable view of the president, while 39% take an unfavorable view. There has been little change in favorability ratings of Barack Obama since the summer of 2010. Compared with other recent presidents, Barack Obama is rated about the same as Bill Clinton at a comparable point in his presidency and is seen less favorably than George W. Bush at the outbreak of the Iraq War, about two years into his first term. Nearly nine-in-ten Democrats (88%) say they have a favorable view of Obama, compared with 22% of Republicans and 54% of independents. Nearly seven-in-ten Americans (69%) hold a favorable view of First Lady Michelle Obama; just 21% hold an unfavorable view. Michelle Obama’s favorability rating has rebounded from a modest dip in December 2010 and now matches her rating from June 2010. 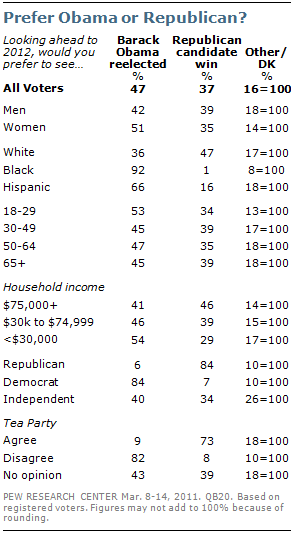 Three-quarters of women (75%) view Michelle Obama favorably as do 67% of independents. 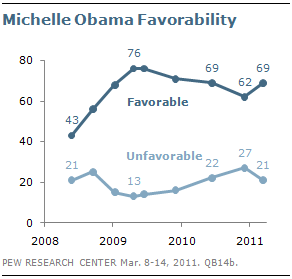 Even among Republicans, about as many hold a favorable view (44%) of Michelle Obama as an unfavorable opinion (43%). Two months after he became House speaker, John Boehner is still not widely known. About a quarter (26%) views him favorably, while 27% view him unfavorably. However, 48% cannot rate or have not heard of Boehner. Among Republicans, 42% view Boehner favorably, 15% unfavorably; 43% do not offer an opinion. Those who agree with the Tea Party movement view Boehner favorably by a 49%-11% margin. By contrast, a majority of those who disagree with the Tea Party hold an unfavorable view of Boehner (53%). Bill Clinton‘s favorability rating has rebounded since February 2008 to match all-time highs. In the current survey, 67% hold a favorable opinion of the former president, while 29% have an unfavorable view. Since February 2008 – during the contentious Democratic primary battle between Hillary Clinton and Barack Obama – Bill Clinton’s overall favorability ratings have climbed 15 points. At 67%, Bill Clinton’s favorable rating is as high as it has been in Pew Research surveys dating back to November 1991. 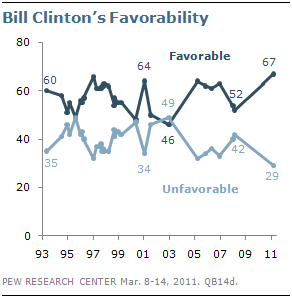 In January 2001, as Clinton left office, a comparable 64% viewed him favorably. The rise in favorable views of Clinton has taken place across most demographic groups, including a significant increase among Republicans. In the current survey, 40% of Republicans view Bill Clinton favorably, up 24 points from February 2008. Two-thirds (66%) of independents have a favorable view of Clinton, up 13 points from three years ago. Democrats have been more stable in their views; 89% view Bill Clinton favorably, up seven points from February 2008. Bill Clinton also receives an overwhelmingly positive rating from blacks, 88% of whom hold a favorable opinion of him. George W. Bush continues to be viewed more unfavorably (54%) than favorably (42%); however this rating reflects a modest improvement in views and marks the first time in several years that Bush’s favorability has edged into the 40s. 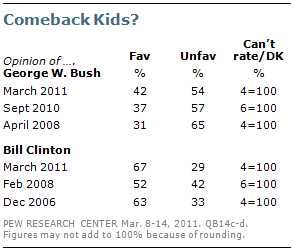 In April 2008, just 31% viewed Bush favorably. Since then, ratings have improved: to 37% in September of 2010 and then up to 42% in the current survey. 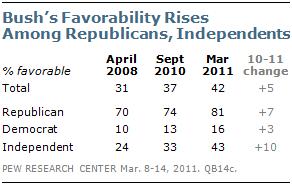 Since September, favorable opinions of Bush have increased among independents and Republicans. Currently, 43% of independents view Bush favorably, up from 33% in September. About eight-in-ten Republicans (81%) hold a positive view of Bush, up seven points from the fall. By contrast, favorable views of Bush among Democrats are little changed from September. And while Bill Clinton receives some positive ratings from members of the opposite party, Bush continues to receive very poor ratings from Democrats: 82% view him unfavorably; just 16% take a favorable view.